The 'New Look' launched by Christian Dior (1905-57) in 1947 made very small waists fashionable. Dior used firm underpinnings such as girdles, under-wired bustiers, and tulle and horsehair petticoats to achieve this. As the 1950s progressed, foundation and support garments became increasingly sophisticated. Lightweight materials such as nylon and new stretch fabrics, seen here, ensured greater comfort. This is a ready-to-wear corset, created by Dior. It was given to the museum when a London lingerie shop closed and gave the V&A its stock. The original hand-written price-tag is still on the corset and gives the name of the design as ‘Colette’. It also gives the price as £8, which was just over an average week’s wages in the middle of the 1950s. Girdle of pink elastic. With a centre panel of white nylon and pink velvet bands in diamond shapes, bordered with pink lace. Bottom hem trimmed with pink lace and with integral suspender straps. Side left zip fastening with pink ribbon. This ready-to-wear Dior corset girdle was donated by the original owner's granddaughter and comprises stock left over from the closure of the owner's lingerie shop. A couture garment usually included meticulously constructed undergarments. They were either integrated into the structure of the garment, or made separately. In creating the New Look after the war, Dior used firm underpinnings such as girdles, under-wired bustiers, and tulle and horsehair petticoats. He placed extra padding on the hips and bust to ensure a smooth womanly figure. As the 1950s progressed, foundation and support garments became increasingly sophisticated. Lightweight materials such as nylon and new stretch fabrics ensured greater comfort. 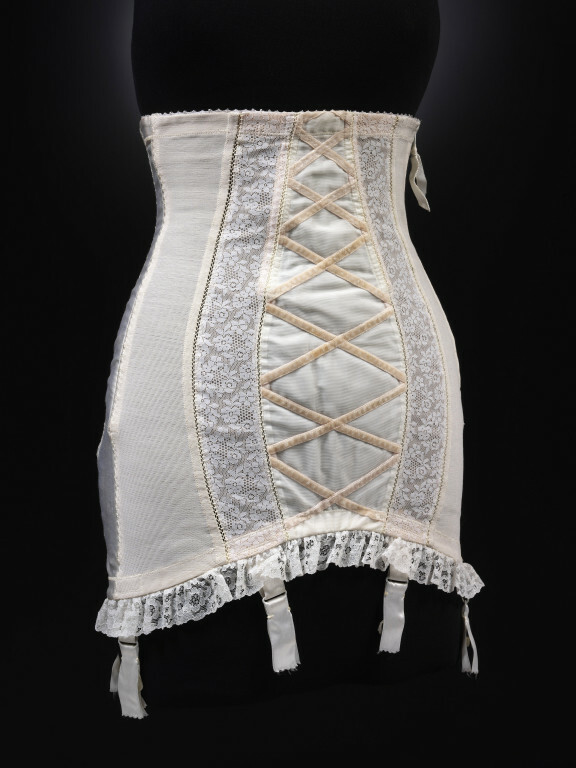 This heavy-duty ready-to-wear corset was given to the V&A following the closure of a London lingerie shop.